The tour starts from Kebon Roek traditional market. This market is located in Ampenan area. This traditional market sells various types of local needs such as fruits, fishes, vegetables and spices. The tour continues to Banyumulek, where you can visit the Lombok’s famous handmade pottery village and continue to Sukarara village which is famed as the producer of good quality Lombok’s woven cloth. Later the trip continue to Lombok’s King summer palace of Narmada. 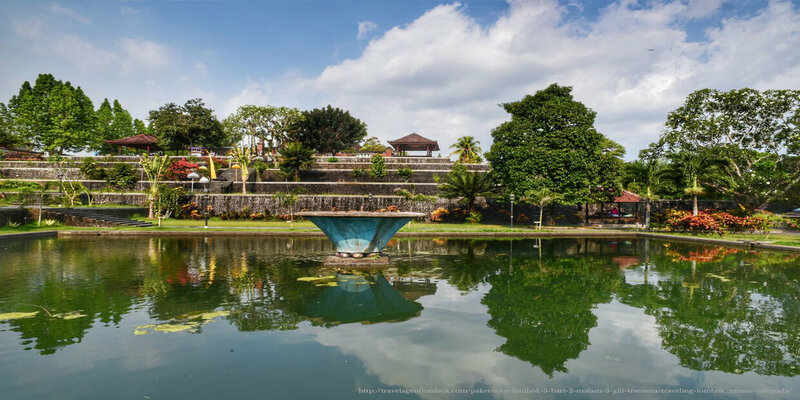 Narmada Garden is built in 1727 as it is designed as a replica of Mount Rinjani. The story of Narmada Garden begins when King Anak Agung Ngurah became too old to do the ritual sacrifice (pekelem) to the top of Mount Rinjani, he decided to build a replica on the city center. After visiting Narmada Garden, we will end up at one of the holiest Hindu temple called Lingsar Temple. The temple itself was built in 1714 by King Anak Agung Ngurah, and nestled beautifully in lush rice fields. Once a year sometime in November or December at the time 6th full moon, there will be a festival held in Lingsar called “ Perang Topat “ (ceremonial war with rice cakes wrapped in woven coconut leaves), as the sign of thanksgiving for all God’s blessings. On your way back to Katamaran Resort, you will visit the very evocative temple of Batu Bolong. The Batu Bolong temple is about three kilometers from central Senggigi. It is built on a black rock and got the natural hole on the underneath of the temple. The temple is relaxing surrounding facing to Bali’s Mount Agung.